In his Jan. 15-19 state and pastoral visit to the Philippines. Pope Francis spoke to Filipinos on his thoughts about issues and concerns that confront the country and the world. He called for an end to corruption and for fair treatment for the poor, and personally consoled with the survivors of supertyphoon Haiyan. This post gathers the full transcripts, highlights and videos of the Papal remarks in the Philippines. The pope also led the people gathered at the Tacloban Airport mass in an impromptu thanksgiving prayer after Communion. 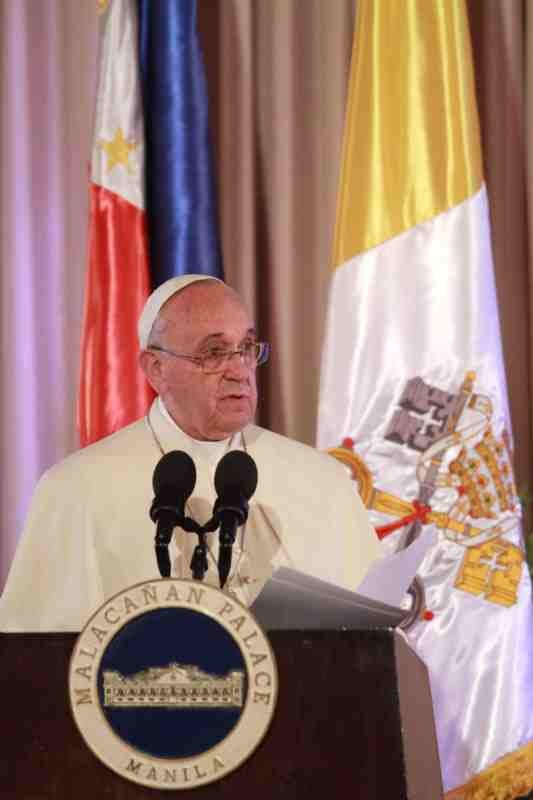 Pope Francis’ first speech in the Philippines, delivered at Malacanang, touched several topics. …this visit is meant to express my closeness to our brothers and sisters who endured the suffering, loss and devastation caused by Typhoon Yolanda. As many voices in your nation have pointed out, it is now, more than ever, necessary that political leaders be outstanding for honesty, integrity and commitment to the common good. Essential to the attainment of … national goals is the moral imperative of ensuring social justice and respect for human dignity. The great biblical tradition enjoins on all peoples the duty to hear the voice of the poor. It bids us break the bonds of injustice and oppression which give rise to glaring, and indeed scandalous, social inequalities. Reforming the social structures which perpetuate poverty and the exclusion of the poor first requires a conversion of mind and heart. I hope that this prophetic summons will challenge everyone, at all levels of society, to reject every form of corruption which diverts resources from the poor, and to make concerted efforts to ensure the inclusion of every man and woman and child in the life of the community. I would also mention the oftneglected yet real contribution of Filipinos of the diaspora to the life and welfare of the societies in which they live. In a particular way, I express my trust that the progress made in bringing peace to the south of the country will result in just solutions in accord with the nation’s founding principles and respectful of the inalienable rights of all, including the indigenous peoples and religious minorities. 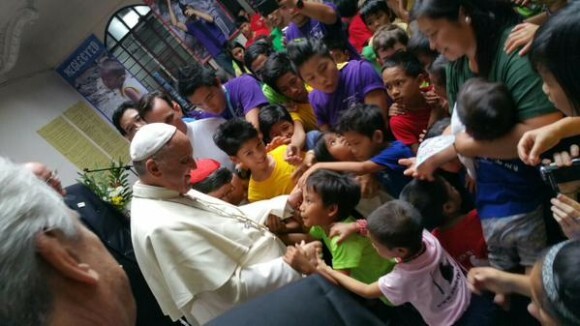 After the mass at the Manila Cathedral, Pope Francis discreetly met with street children of Tulay ng Kabataan – an event that was not in his official itinerary. 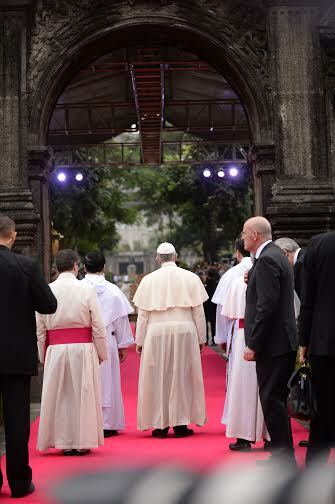 Pope Francis also presided over a Mass with 2,000 bishops, priests and religious at the Manila Cathedral, and thousands more of Filipinos outside who followed the services from big screens. In his second speech in the Philippines, the pope’s homily focus on Filipino church officials, priests, and religious sisters and brothers. As the Bishops of the Philippines have rightly taught, the Church in the Philippines is called to acknowledge and combat the causes of the deeply rooted inequality and injustice which mar the face of Filipino society, plainly contradicting the teaching of Christ. Only by becoming poor ourselves, by stripping away our complacency, will we be able to identify with the least of our brothers and sisters. We will see things in a new light and thus respond with honesty and integrity to the challenge of proclaiming the radicalism of the Gospel in a society which has grown comfortable with social exclusion, polarization and scandalous inequality. [B]e especially mindful of our call to be missionary disciples of Jesus. This means being ready to go beyond your homes and to care for our brothers and sisters who are most in need. I ask you especially to show concern for those who do not have a family of their own, in particular those who are elderly and children without parents. Never let them feel isolated, alone and abandoned, but help them to know that God has not forgotten them. The most poignant and most powerful part of his visit was Pope Francis’ trip to Tacloban, where tens of thousands of survivors of supertyphoon Haiyan waited for him. 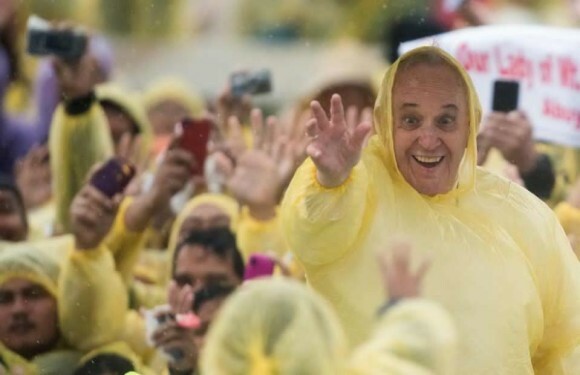 Donning a yellow poncho similar to what the throngs were wearing, the pope said mass amid a storm approaching Eastern Visayas. I would like to tell you something close to my heart: When I saw from Rome that catastrophe I felt that I had to be here. And on those very days I decided to come here I’m here to be with you. A little bit late, I have to say, but I’m here. I don’t know what to say to you, but the Lord does know what to say to you. Some of you lost part of your families. All I can do is keep silent, and I walk with you all with my silent heart. We have just celebrated the passion, death and resurrection of Christ. Jesus has gone before us on this journey and he is with us whenever we gather to pray and celebrate. Thank you, Lord, for being with us here today. Thank you, Lord, for sharing our sorrows. Thank you, Lord, for giving us hope. Thank you, Lord, for your great mercy. Thank you, Lord, because you wanted to be like one of us. Thank you, Lord, because you keep ever close to us, even when we carry our crosses. Thank you, Lord, for giving us hope. Lord, may no one rob us of hope! Thank you, Lord, because in the darkest moment of your own life, on the cross, you thought of us and you left us a mother, your mother. Thank you Lord for not leaving us orphans! Stormy weather cut short the pope’s visit to Tacloban. Although the pope was not able to deliver a prepared message the Palo Cathedral, the Vatican quickly put it up its website. Vatican spokesman Federico Lombardi later told a press briefing that the pope wanted to make the prepared message public. 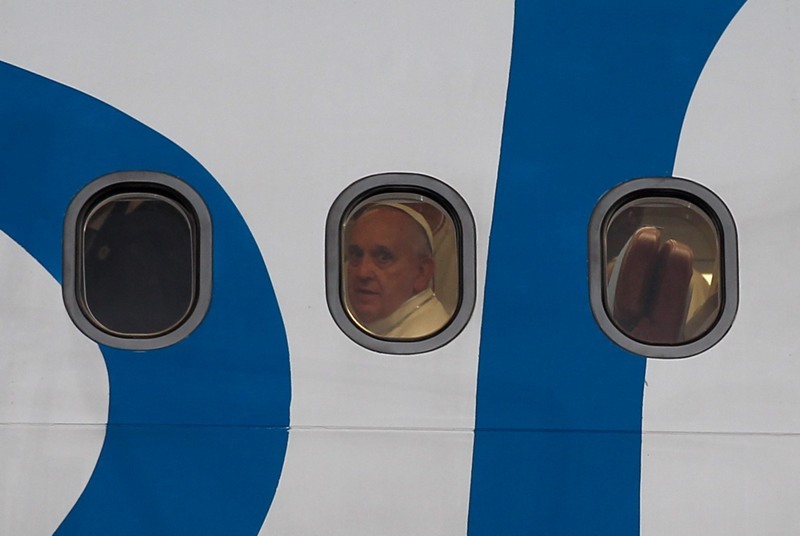 A menacing storm cut short Pope Francis’ visit to Tacloban and Leyte. But he still went to Palo Cathedral to briefly meet, bless and apologize the people there. Photo from Radio Vaticana. I ask that the poor throughout this country be treated fairly – that their dignity be respected, that political and economic policies be just and inclusive, that opportunities for employment and education be developed, and that obstacles to the delivery of social services be removed. Our treatment of the poor is the criterion on which each of us will be judged (cf. Mt 25:40, 45). I ask all of you, and all responsible for the good of society, to renew your commitment to social justice and the betterment of the poor, both here and in the Philippines as a whole. I hope that you will always realize that true happiness comes from helping others, giving ourselves to them in self-sacrifice, mercy and compassion. Pope Francis again set aside his prepared remarks for the youth rally at Manila’s University of Santo Tomas, the pontifical university which had also hosted Pope Paul VI and Pope John Paul II. Instead, the pope spoke extemporaneously in Spanish. There’s only a very small representation of girls among you. Too little. Women have much to tell us in today’s society. Sometimes we are too “machistas” and we don’t allow enough space to women. But women can see things from a different angle to us, with a different eye. Women are able to pose questions we men are unable to understand. Look out for this fact: she is the only one who has put a question for which there is no answer. She couldn’t put it into words but expressed it with tears. So when the next pope comes to Manila, please let there be more girls. You still lack one thing. Become a beggar. This is what you still lack. Learn how to beg. This isn’t easy to understand. To learn how to beg. To learn how to receive with humility. To learn to be evangelized by the poor, by those we help, the sick, orphans, they have so much to give us. Have I learned how to beg? Or am I self-sufficient? Do I think I need nothing? Do you know you too are poor? Do you know your own poverty and your need to receive? Do you let yourselves be evangelised by those you serve? This is what helps you mature in your commitment to give to others. Learn how to open your hand from your very own poverty. Do you think of the poor? Do you feel with the poor? Do you do something for the poor? Do you ask the poor to give you the wisdom they have? 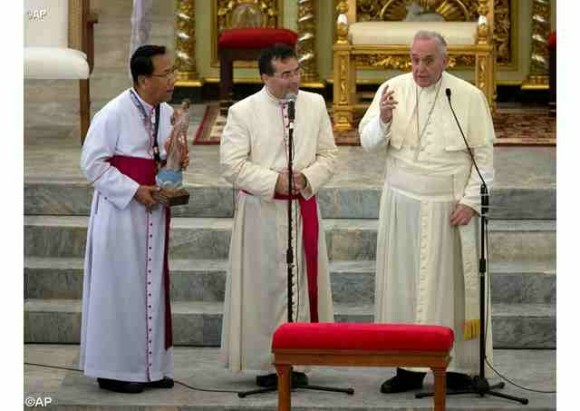 Pope Francis presided over a mass at the Luneta at the conclusion of his state and pastoral visit to the Philippines. Now, at the end of my visit to the Philippines, I commend you to him, to Jesus who came among us as a child. May he enable all the beloved people of this country to work together, protecting one another, beginning with your families and communities, in building a world of justice, integrity and peace. This is a very useful post. Thank you for providing the links! God bless!